The THR2 Board is a hardware accelerator that provides high-speed and high-quality binarization of color and grayscale images. The VST-1000 chip at the heart of the THR2 creates the world’s highest quality bitonal images via a technique called edge thresholding. The THR2 Board can serve as a production facility for bulk conversion of color or grayscale images to binary images. This may occur in color imaging systems which need to output to printers or fax modems. It may occur in systems where a color orientation is taken for archiving, but where OCR engines require binary images. The VST-1000 chips operate at up to 30 million pixels per second and (in an embedded design) may be operated in parallel to achieves pixel rates as high as 80 million pixels per second or more. 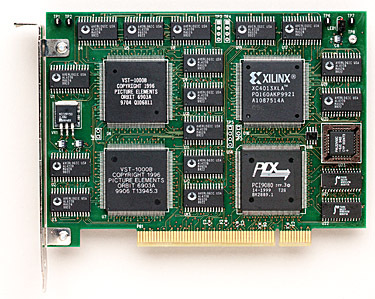 The THR2 Board is capable of keeping them fed with fresh grayscale data from host memory over the PCI bus at burst rates of up to 132 Mbytes per second. Output binary pixels are collected into 32 bit long words and buffered up for burst transfers back into a host memory output buffer at up to 132 Mbyte per second rates. Up-scaling hardware is included in the THR2 to cover the common requirement to create binary images at up to two times the resolution of the source color or grayscale images. This produces smoother, better-looking binary images which produce superior OCR results. The VST-1000 chips have a despeckling capability built in. This permits removal of small, isolated black objects on the background of the binary image and of small white voids in the interior of characters or other black regions. While the size limits are programmable, the despeckler may remove all black speckles up to 4 by 4 pixels in size and all white regions up to 3 by 3 pixels in size. In addition, the connectivity (used to determine whether an object is isolated or not) may be programmed to be either 4-way or 8-way, allowing a better job at achieving the desired retention or elimination of halftone patterns. The human eye extracts edge information at high resolution in the first stage of vision and pattern recognition. The edges in a scene at high resolution provide the location information upon which all further processing is based. Luminance (brightness or tonality or shading) and chrominance (color) information are handled at lower resolutions. The bitonal images upon which much of the document imaging business traditionally has been based give a practical confirmation of these facts; bitonal images have high spatial resolution, but low tonal resolution or tonality. In fact, they only have two tones or shades: full white and full black. The revolutionary edge thresholding method used by the Picture Elements VST-1000 integrated circuit permits the creation of very high definition binary images. These images are characterized by accurate stroke width rendition, exceptional, carefully-chiselled clarity of fine detail and superior reproduction of the broader, fuzzy edges seen in carbon copies and overnight express waybills.